Welcome to the Fantasy Six Pack! If this is your first time joining us, we highlight six golfers to use in two popular fantasy golf platforms, DraftKings and FanDuel. On each, you must select six golfers for your lineup under a specific salary cap (DraftKings $50,000, FanDuel $60,000). A little about me: I’m a golf nut with a trending upwards 4 handicap (since having my son James, it’s skyrocketed) and a nose for analytics. According to Rotogrinders, I’m one of the top daily fantasy golf players and ranked inside the top five of all players. Come check out all of my analysis at Awesemo.com, where last week my insane run continued and I won over $40,000. Recap of Last week: Other than Jordan Spieth and a letdown week from Rafa Cabrera Bello, it was a really solid week with a pair of top fives and a couple of other solid finishes. Skills emphasized: The Copperhead Course at Innisbrook Resort in Palm Harbor tests all facets of the golfer’s game. But interestingly enough, only one of the last four winners has lost strokes off the tee. The main reason why is because the strokes gained statistic only really kicks in when drives exceed 298.5 yards and are on the fairway in ideal pin position. There are a ton of forced layups off the tee at Copperhead, making that statistic rather difficult to generate. Instead, we want golfers that are putting well and hitting their irons solidly. Dustin Johnson (5/1 DraftKings-$11,500; FanDuel-$12,600): I generally don’t like to write about the same golfer on back-to-back weeks. It’s just not something I like to do. But in this case, DJ is the clear cut class of the field. He’s got 5/1 odds to win. 5/1. That’s incredibly short even for a field of this caliber. However, his DraftKings price is reasonable, and while DJ hasn’t played here in over five years, he’s got the game to compete anywhere. He’s got the ability to turn the 1st, 5th, 6th and 9th holes into birdie finishes with his length off the tee, and DJ should be able to take advantage of the easier back-nine as well. Look for DJ to contend this week, as well as for the rare turkey; a win in three straight starts at Valspar, Match Play, and Augusta. Sergio Garcia (16/1 DraftKings-$10,100; FanDuel-$11,300): Talk about a golf course that fits a golfer to a tee; it’s here and it’s Sergio Garcia. He’s coming into the week playing great golf with back-to-back top-25 finishes in his two starts on the Florida swing. He’s gained strokes in all four measured statistical categories in both those starts, which is something not many can say. If that type of form continues this week, he’ll be one of the last men standing on Sunday again. Ollie Schniederjans (75/1 DraftKings-$7,700; FanDuel-$8,100): It’s been quite sometime since Ollie was an amateur competing for the British Open. But here we are, and Ollie is still trying to find his way on the PGA Tour. Then suddenly, it’s Sunday at the Players, and Ollie’s within one shot of the lead! It didn’t last long, but still, it had to at least raise some eyebrows. Let’s see if the form continues into this week! 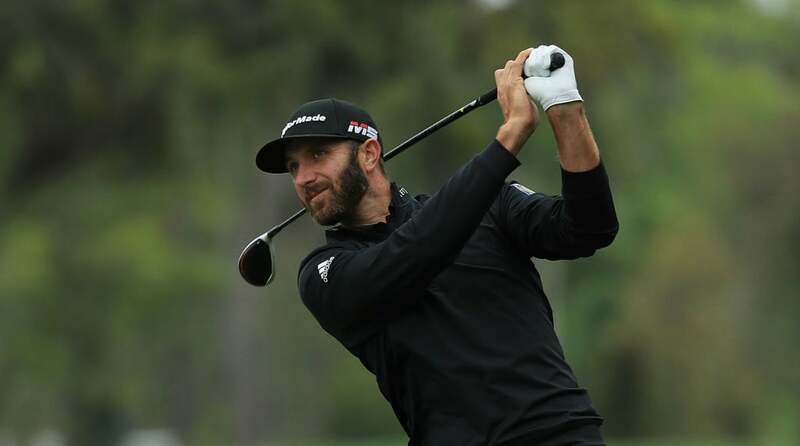 Dustin Johnson is the favorite coming into the Valspar Championship this week. “Looks good off the tee” segment: This section is going to focus on a golfer that is coming into this week in great form, but may be set for a bad week, or some “regression” off of his recent results. Jason Day (10/1 DraftKings-$10,700; FanDuel-$11,800): Sticking with the Jason theme in this segment, this Jason had a great bounce back last week at The Players. However, I’m not fully sold here, especially with the course requiring accuracy off the tee and precise iron shots, something that Jason has struggled with at times this year. For me, I’d rather play Sergio. “Out of Bounds” play of the week: This section is going to focus on a golfer that may not be well known in the golfing world yet. It should provide some “positive variance” for your Daily Fantasy Contests this week! Akshay Bhatia (300/1 DraftKings-$6,000; FanDuel-$7,000): If you haven’t read any stories yet this week about this 17-year-old star, I’ll give you the quick high-level pitch. Bhatia has decided to forgo college in preparation of becoming a pro golfer, which he will do once he turns 18 next January. Since the PGA Tour has a rule that you must be 18 years old to be a Tour pro, Bhatia will make his PGA Tour debut as a junior at the Valspar Championship. This isn’t something new to the event, as the Copperhead Course has been littered with college golfers and amateurs playing it over the last several years. The tournament lends itself to lower scoring, thus keeping good putters around longer. Bhatia prides himself on his putting, so this won’t be the last time we hear his name on the PGA Tour. Sungjae Im (75/1 DraftKings-$7,700; FanDuel-$9,200): If anyone needs a mulligan in a bad way, it’s Im. After his hole-in-one on the par-3 13th hole at the Players, Im got himself back into the tournament and well inside the cut line. He arrived at the 17th hole with a score of 2-under par, hovering just above the cut line of 1-under. Well, we all know how this story ends. He went pin seeking to a back pin, and lost it long in the water. He wasn’t able to save bogey and wound up missing the cut by one stroke. Ouch. 1. $5 buy-in called “Drive the Green” with a top prize of $100,000 and a guaranteed prize pool of $500,000. 2. $444 buy-in called “Pressure Putt” with a top prize of $100,000, and a guaranteed prize pool of $350,000. 3. $44 buy-in called “Club Twirl” with a top prize of $100,000, and a guaranteed prize pool of $400,000. 1. $3 buy-in called “Stinger,” with a top prize of $5,000, and a guaranteed prize pool of $20,000. 2. $7.77 buy-in called “Eagle,” with a top prize of $20,000, and a guaranteed prize pool of $100,000. 3. $44 buy-in called “Monster,” with a top prize of $10,000, and a guaranteed prize pool of $40,000. That’s it for this week, folks! As always, check my bio below if you’d like to get in touch. Jason Rouslin is the lead golf analyst for Awesemo.com. He has been playing golf for the last 20 years, betting on golf for the last five and writing about golf for the last two. Connect with him on Twitter @dfsgolfer23 or check him out on the @rotogrinders live golf show on Tuesdays @ 8:00 p.m. and on the live @Awesemo_Com golf show at 9:00 p.m. Wednesdays.